Find all the local Halloween haunted houses in Rhode Island here at Funtober for 2018. 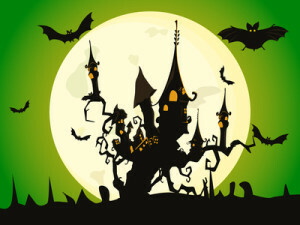 We list all the haunted hayrides, haunted houses, haunted trails and more Halloween entertainment here in your state. Expect to find zombies, vampires, walking dead, witches and lots of Freddy’s and Jason’s roaming your local haunt. In Rhode Island you are never far from a great haunted attraction featuring live actors, animatronics, Hollywood set designs, creepy costumes, and air blasters. Funtober also lists Facebooks most liked haunted attractions in the county in our popular article: America’s Best Top 100 Haunted Houses in 2013 (with videos). Do you run a haunted house in the United States? More than 500,000 people came to Funtober haunts last year. Please see our advertising page or contact us for more information. Opening October 5th as a bigger and better 13th World. Haunted Hill has been re-themed with all new attractions. Same location as before. The owners have been terrifying people in southern New England for over a decade. Tickets are $18-20. Attraction runs Friday, Saturday, and Sunday nights in October. Doors are open from 7 pm to 10 pm most nights. This terror attraction opens on October 5th. Open every Friday and Saturday nights plus Sunday nights in October. Featured 5 attractions include Psycho Alley, Asylum, Dracula’s Hideway, 4D Blackout, and Ghost Cemetery. Basic tickets are $17.99-20.00 but there are some other options and discounts available. See their web page for full pricing and schedule details. Opens for 2018 season on October 12th. It is open from 6 pm until 10 pm. They are open Friday and Saturday nights in October. Note this is a real haunted house and during October they also conduct paranormal investigations. Ask about being part of their 10:30 pm ghost hunting investigations. This is an annual event at Fort Adams. Back again with opening night on September 28th. Haunting Cranston for 30 years Haunted Labyrinth advertises itself at the “Scariest Haunted House in New England. It features themed room and scary mazes. Tickets are $12-13. It is open Friday, Saturday, and Sunday nights from 7 pm to 10 pm in October. It is located at the Hope Youth Center. Opening night is September 21st. You will find “terror at every turn” at Scary Acres owned by Confreda Greenhouses and Farms. Allow about one hour to go through this haunted attraction. Scary Acres is open every Friday, Saturday, and Sunday nights. It runs from 6:30 pm to 10 pm nightly. Ticket price is $20 and includes both the Haunted Hay Ride and Haunted Corn Maze. Located at Slater Park’s Daggett Farm. Dates open are Friday and Saturday nights in October. If you tire of the Rhode Island haunted houses, jump across the border to the haunted attractions in Connecticut or Massachusetts. Have you visited one of these haunted houses? Future readers would be interested in hearing what you thought. Did you have fun? Was it worth the price? Would you recommend it to visitors here? Any suggestions to maximize the experience? I’ll gladly publish what you send me and give you a virtual hug.